Friends S2:E1 – Oh. My. God. It is such a thrill to be back for my second season blogging Friends for theLeftAhead. I’m back with renewed energy and a new attitude about the task at hand. Yep, gone are the negative disposition and lukewarm commitment of last season and here in their place are swimming pools full of Red Bull on the ready for serving an endless supply of energy to my inner-Rudy Ruettiger. That’s right…this year I’m getting my Kevin Garnett on by staring down the remaining nine years of this project and screaming “ANYTHING IS POSSIBLE.” How, you ask, was I able to accomplish such a dramatic reversal from my negative approach to last season? (An approach that quite honestly should have gotten me fired during a “when keeping it real goes terribly wrong” moment with my editor-n-chief.) Well, you inquisitive reader you, I’d be happy to answer your question. Let me tell you a little secret. Four months away from a word processor can be extremely therapeutic for a disillusioned writer. I’ve been on a beach (with an umbrella drink in my hand) for 120 straight days. Until this morning, I hadn’t as much as looked at a computer or thought about a deadline for 2880 straight hours. Essentially, I’ve been living Peter Gibbons fantasy since May 19th and let me tell you, Bob…it’s been everything I thought it could be. Indeed, four months of doing nothing has a way of putting you in a perpetual state of zen. But since all good things must come to an end, I was fearful that coming back to work would seriously harsh my chi. So when I fired up my trusty Macbook this morning to begin working on the second leg of my psychotic half-baked ten leg marathon of a blog series, I suspected I’d feel dread the second I heard that annoying tone the computer makes during the Apple logo screen. To my surprise, it was not dread I felt but rather excitement. I discovered that I’m actually fired up to tackle the challenge at hand. (Thanks, inherited wealth and seasonal employment.) Batteries? Recharged. Recap in the Key of Phoebe – This is the one where Rachel discovers that Ross has met someone in China after she goes to the airport to welcome him home and reveal her feelings, Joey’s tailor takes advantage of Chandler when he goes in for a fitting, Phoebe mistakenly gives Monica a haircut to look like Dudley Moore when Monica asked for a haircut to look like Demi Moore, and Phoebe’s observation that “this is huge” in reference to the idea of Rachel and Ross becoming a couple is completely destroyed when Rachel makes to terrible decision of hooking back up with Paulo in the aftermath of everyone realizing that Ross is head over heals smitten with his new girlfriend Julie. Gandalf Gaffes – Boys and girls, we’re starting Season Two off on the right foot by recording a Gandalf Gaffe in the official scorer’s book. Our gaffe today is unusual because both the established precedent and the contradiction take place within today’s episode. The precedent in question is the establishment of Ross’s preexisting relationship with Julie. 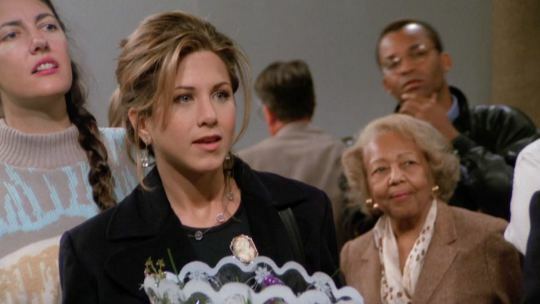 Early on in the episode, when Ross and Julie first show up at Monica and Rachel’s apartment so that Julie can meet everyone, they reference having known each other prior to the China trip. After absorbing the shock of discovering that Ross has met someone in China, Monica asks, “This is amazing. I mean, how, how did this happen?” Julie responds, “Well, Ross and I were in grad school together.” Ross continues, “But we haven’t seen each other since then. Well I land in China, guess who’s in charge of the dig?” The precedent has clearly been established that Ross knew Julie during his time in grad school. However, later in the episode when Chandler (with Rachel’s urging) is grilling Ross for more information about the fact that he left on his China trip madly in love with Rachel and came back with a new girlfriend, Ross contradicts the established timeline of knowing Julie in grad school. When Chandler asks, “So what the hell happened to you in China? I mean, when last we left you, you were totally in love with, you know.” Ross responds, “Look, you were right. She looks at me and sees a friend, that’s all. But then I met Julie, and I don’t know, we’re havin’ a great time. And I have to say, I never would’ve gone for it with her if it hadn’t been for you.” Here in lies our gaffe. Ross infers that he ‘met Julie’ in China which contradicts the fact that he already knew her from grad school. This is admittedly nit-picky, but our mission is to uncover every Gandalf Gaffe no matter how large or small. Even though this is the tiniest of a level one infraction, it is a level one infraction nonetheless. Gandalf Gaffe #6: Early in the Season 2 premiere, Ross talks about having known Julie in grad school. Later in the episode he contradicts himself by suggesting that he met Julie for the first time during his dig in China.